Takotsubo cardiomyopathy (TCM) is characterized by transient left ventricular dysfunction without any evidence of coronary artery obstruction. In literature, there are reports of TCM caused by emotional or physical stress, drug use, hormone imbalance, or medical conditions such as pulmonary disease, sepsis, and trauma; however, a relationship between TCM and Clostridium difficile infection has not previously been described. The present report brings to light the risk of TCM in patients with C. difficile infection. A 65-year-old female, who was recently treated with amoxicillin for bacterial sinusitis in outpatient for 7 days, presented to the Mount Sinai St. Luke's Emergency Department with severe abdominal pain, fever, and diarrhea. Her vital signs were notable for temperature 39°C, heart rate 112 beats/min, and blood pressure 99/65 mmHg. Abdominal examination revealed hyperactive bowel sounds and diffuse abdominal tenderness with rebound. There was no abdominal rigidity or guarding. She was non-alcoholic, non-smoker, and drug-free. Initial laboratory evaluation was remarkable for white cell count 17,000/μL (4-11000/μL) and creatinine 1.7 mg/dl. Enzyme immunoassay was positive for toxigenic strain of C. difficile. The patient was resuscitated with intravenous fluids, and oral metronidazole therapy was initiated. On the night of her admission, she started having retrosternal chest pain of severe intensity with moderate distress in breathing. 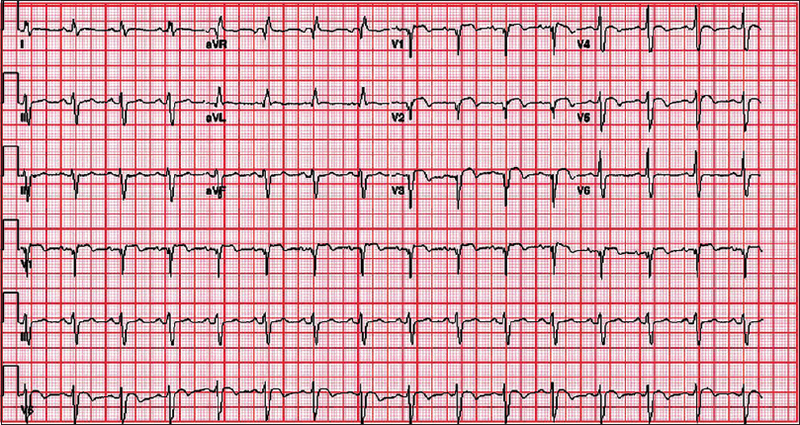 Electrocardiogram (EKG) showed ST-segment elevation in the chest leads V1-V5, consistent with left main coronary artery or left anterior descending artery occlusion [Figure 1]. Aspirin 325 mg was administered. Cardiac biomarkers, troponin-I and b-type natriuretic peptide, were elevated at 2.16 ng/mL and 447 pg/mL, respectively. Serial troponin-I was trended with a peak level of 9.8 ng/mL. Chest radiography and hepatobiliary ultrasound were unremarkable. 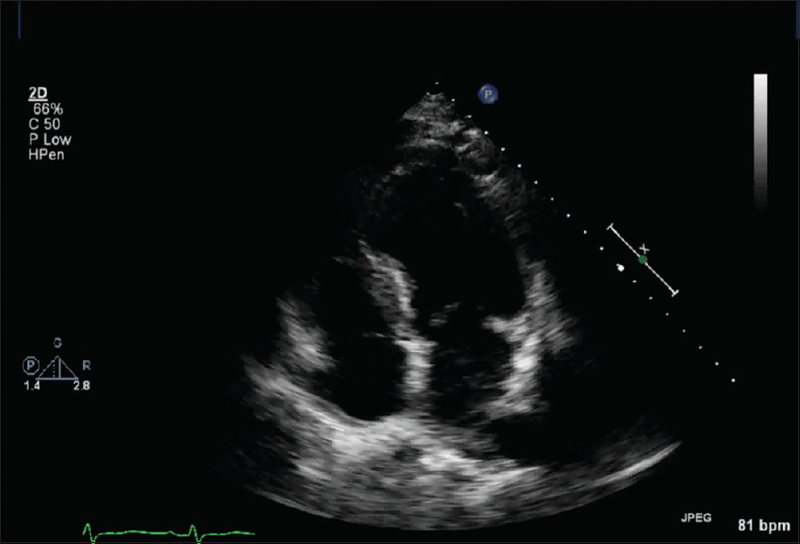 Initial transthoracic echocardiogram showed apical ballooning and global left ventricular hypokinesis with a left ventricle ejection fraction (LVEF) of ~ 20-25% [Figure 2]. ST-segment elevation myocardial (STEMI) infarction code was activated. Emergent coronary angiogram demonstrated normal coronary arteries with no coronary disease but consistent with global hypokinesia. Left ventriculogram showed hypokinetic left ventricular apex consistent with TCM [Figure 3]. After supportive treatment, the patient's condition improved along with resolution of fever and diarrhea. On day 5 of her admission, EKG showed normalization of ST-segment elevation, and she was discharged from the hospital. 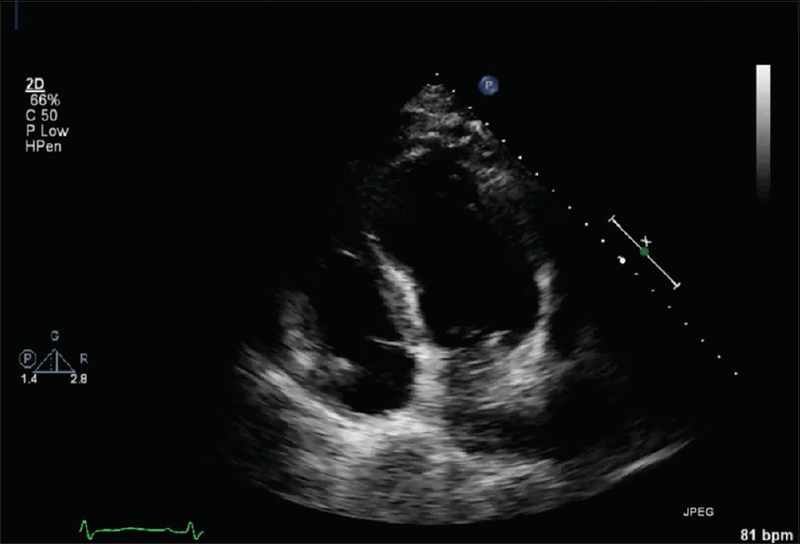 A repeat echocardiogram 2 weeks later demonstrated an improved LVEF of ~60% indicating the transient nature of the disease, essential for diagnosis [Figure 4]. The most widely accepted hypotheses for TCM pathogenesis are catecholamine-toxicity and microvascular dysfunction. C. difficile as a classic anaerobic bacterium has been associated with the sympathetic overdrive. Toxigenic strains of C. difficile release two large molecular weight proteinaceous exotoxins identified as toxins A and B. Xia et al. demonstrated in their bench research that C. difficile toxin A causes prevention of sympathetic inactivation of the enteric microcircuits that generate intestinal motor activity and other intestinal behaviors during C. difficile enteritis. Patients with predisposition to TCM have high endogenous levels of catecholamines along with differential distribution of adrenergic receptors on the myocardial surface. This hypothesis is further strengthened by highlighting the role of other sympathetic overdrive states such as acute pancreatitis, pheochromocytoma, stroke, and subarachnoid hemorrhage in the causation of TCM. , In addition, the distributive shock that develops with C. difficile infection may result in transient myocardial dysfunction and microvascular hypoperfusion. The pathophysiologic mechanism of TCM development in our patient may be designated as the catecholamine surge in the setting of C. difficile and hypovolemia. However, the exact pathogenesis of induced-TCM remains to be determined and merits further investigation. The present case highlights the first report of C. difficile infection-related TCM. Albeit rare, further clinical studies are warranted to broaden the scope of our knowledge on this association and to frame guidelines to standardize the care of these patients. Sato HT, Uchida T, Dote K, Ishihara M. Tako-tsubo-like left ventricular dysfunction due to multivessel coronary spasm. In: Kodama K, Haze K, Hori M, editors. Clinical Aspect of Myocardial Injury: From Ischemia to Heart Failure. Tokyo: Kagakuhyoronsha Publishing; 1990. p. 56-64. Bybee KA, Prasad A, Barsness GW, Lerman A, Jaffe AS, Murphy JG, et al. Clinical characteristics and thrombolysis in myocardial infarction frame counts in women with transient left ventricular apical ballooning syndrome. Am J Cardiol 2004;94:343-6. Schneider B, Athanasiadis A, Stöllberger C, Pistner W, Schwab J, Gottwald U, et al. Gender differences in the manifestation of tako-tsubo cardiomyopathy. Int J Cardiol 2013;166:584-8. Sharkey SW, Lesser JR, Maron MS, Maron BJ. Why not just call it tako-tsubo cardiomyopathy: A discussion of nomenclature. J Am Coll Cardiol 2011;57:1496-7. Brinjikji W, El-Sayed AM, Salka S. In-hospital mortality among patients with takotsubo cardiomyopathy: A study of the National Inpatient Sample 2008 to 2009. Am Heart J 2012;164:215-21. Sharkey SW, Windenburg DC, Lesser JR, Maron MS, Hauser RG, Lesser JN, et al. Natural history and expansive clinical profile of stress (tako-tsubo) cardiomyopathy. J Am Coll Cardiol 2010;55:333-41. Bruenjes JD, Vallabhajosyula S, Vacek CJ, Fixley JE. 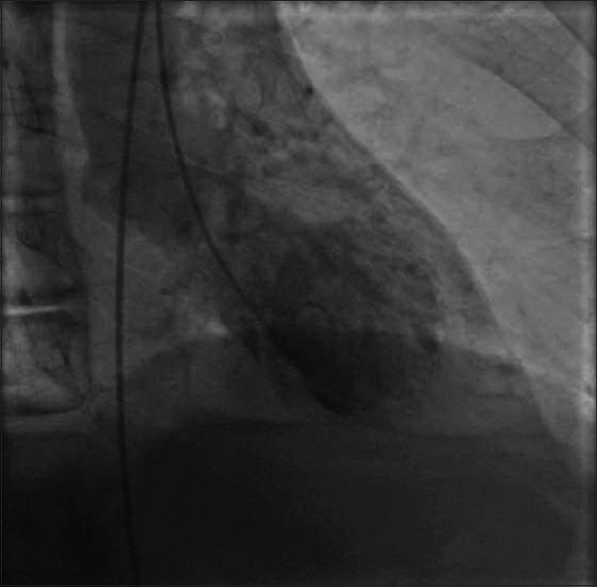 Acute pancreatitis-induced Takotsubo cardiomyopathy in an African American male. ACG Case Rep J 2015;3:53-6. Fernandes CJ Jr., Akamine N, Knobel E. Cardiac troponin: A new serum marker of myocardial injury in sepsis. Intensive Care Med 1999;25:1165-8. Romero-Bermejo FJ, Ruiz-Bailen M, Gil-Cebrian J, Huertos-Ranchal MJ. Sepsis-induced cardiomyopathy. Curr Cardiol Rev 2011;7:163-83. De Giorgi A, Fabbian F, Pala M, Parisi C, Misurati E, Molino C, et al. Takotsubo cardiomyopathy and acute infectious diseases: A mini-review of case reports. Angiology 2015;66:257-61. Park JH, Kang SJ, Song JK, Kim HK, Lim CM, Kang DH, et al. Left ventricular apical ballooning due to severe physical stress in patients admitted to the medical ICU. Chest 2005;128:296-302. El-Sayed AM, Brinjikji W, Salka S. Demographic and co-morbid predictors of stress (takotsubo) cardiomyopathy. Am J Cardiol 2012;110:1368-72. Xia Y, Hu HZ, Liu S, Pothoulakis C, Wood JD. Clostridium difficile toxin a excites enteric neurones and suppresses sympathetic neurotransmission in the guinea pig. Gut 2000;46:481-6. Kelly CP, Becker S, Linevsky JK, Joshi MA, O'Keane JC, Dickey BF, et al. Neutrophil recruitment in clostridium difficile toxin A enteritis in the rabbit. J Clin Invest 1994;93:1257-65.